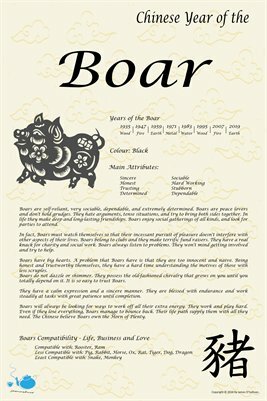 Years of the Chinese Zodiac Boar: 1935 - 1947 - 1959 - 1971 - 1983 - 1995 - 2007 - 2019. Boars are self-reliant, very sociable, dependable, and extremely determined. Boars are peace lovers and don't hold grudges. They hate arguments, tense situations, and try to bring both sides together. In life they make deep and long-lasting friendships. Boars enjoy social gatherings of all kinds, and look for parties to attend.